This is a more things change, more they say the same sort of thing for the week coming into election day. 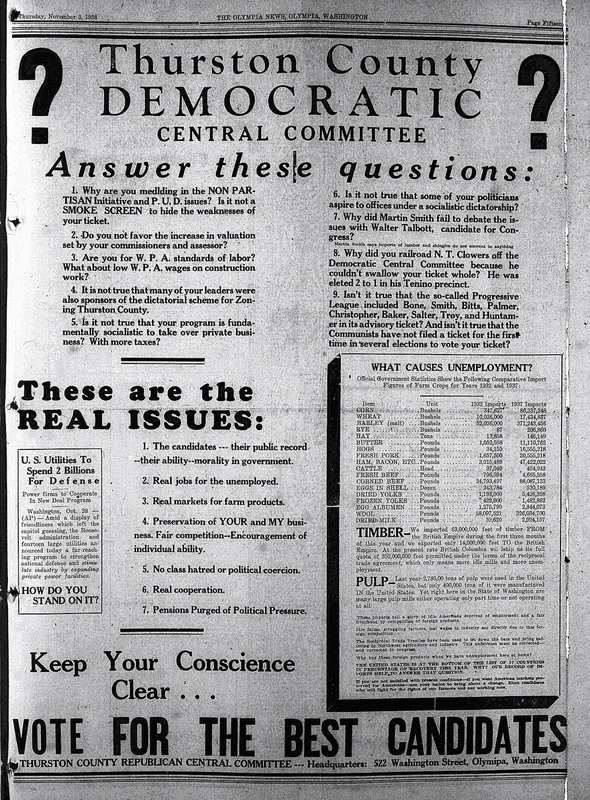 This is an a full page ad that the Thurston County Republican party ran in the Olympian in the weeks leading up to the 1938 election. It is full of amazing statements (amazing! ), mostly either rehashing parochial battles or drastically weird statements about socialism and communism. Is is not true that many of your leaders were also sponsors of the dictatorial scheme for Zoning Thurston County. Is it not true that your program is fundamentally socialistic to take over private business? With more taxes? Is is not true that some of your politicians aspire to offices under a socialistic dictatorship? The first question in that list seems to echo to our current debates (at least over the last 20 years in the era of growth management and endangered species) over land use. I don't know enough about what was going on in Thurston County in 1938 over zoning. But, it smacks of a rural control by urban interest sort of thing. And, after all this huffing and puffing, the Republicans were smacked down in Thurston County in 1938. Only winning a close race for clerk, the Republicans failed to capitalize on what was a fairly good year for Republicans nationwide. Not in Washington though. Or in Thurston County.